Group exercise class offers a social and educational setting for a healthier pregnancy. This aerobic class is designed to have you cushioned and supported in the water while providing a cardiovascular and strength workout. The soothing effect of the water provides a safe and conducive environment for prenatal exercise. For women who have just had a baby, this (mom’s only) fitness class jump starts the drive to get back in shape at the right pace. *A note from your doctor is required before starting class. 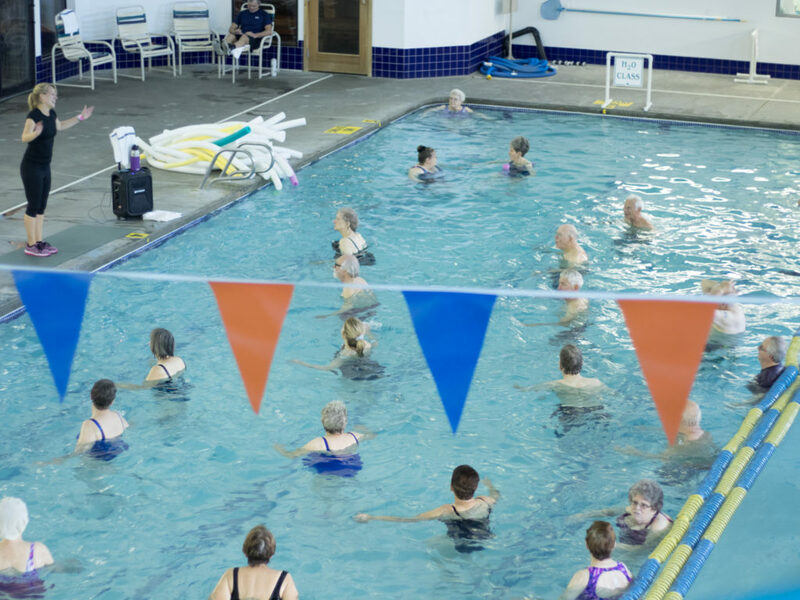 The resistance of the water provides a fitness challenge for both the beginner and seasoned athlete looking for cross training options with lower impact and less stress on the joints. Each movement in the water provides 7x the resistance of a similar movement in the air! These classes include a balance between cardio-fitness and muscle conditioning segments. Designed especially to increase mobility with range of motion while increasing strength and flexibility in a low impact environment. This is an enjoyable class with a loyal, fun-loving group. This class is designed to combine the best of both the Aqua size and Aqua Lite. You will enjoy exercises to increase cardio fitness and muscle conditioning along with others to increase range of motion,all while increasing strength and flexibility. This is an intense, 45-minute, cardio focused workout that incorporates timed interval techniques to increase both strength and endurance. An excellent addition to any fitness regimen.